Familie Flöz is presenting ‘Hotel Paradiso’. The fine-dining Chinese restaurant has added special Diwali desserts to its regular fare. On offer are Honey Noodles with Ice Cream and Kam Gua Lou. 12.30-3.45pm/7.30- 11.45pm. Royal China, Eros Corporate Tower, Nehru Place (49818000). Meal for one, Rs1,200, plus taxes. Nandan Purkayastha’s 15 paintings have used the Rotring ballpoint pen to sketch images of goddess Durga, demons, animals and birds. 11am-7pm. Gallerie Ganesha, Greater Kailash-II (29217306). Prices, Rs55,000 to Rs7.5 lakh. 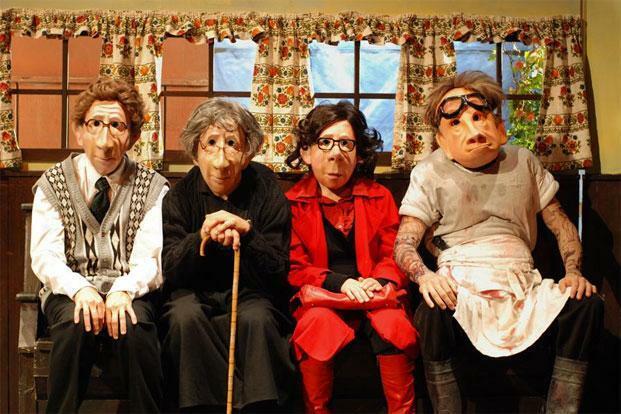 On its maiden tour of India, German production company Familie Flöz is showcasing humour and mime with the help of masks. Todd Haynes’ ‘I’m Not There’. Todd Haynes’ 2007 drama is inspired by the life of singer-songwriter Bob Dylan, who recently won the Nobel Prize for literature. 2 hour, 15 minutes. Varun Kulkarni’s character Sumeet tells the story of an unusual funeral where mourning takes a back seat to other issues in the discussions among family members. Sachin Malvi’s Gogol Ke Kisse is based on two short stories by Russian author Nikolai Gogol: The Overcoat and The Nose. 1 hour, 15 minutes. This one-act Hindi play features Arundhati Nag as Manjula, a Kannada writer whose own image questions her on how she managed to write a global best-seller in English. 1 hour, 10 minutes. This edition’s theme, “It’s About Time”, will see speakers discussing how time and attention shape our lives. The speakers will include singer Soundarya Jayachandran and development specialist Veena Sethuraman. Shoonya will be performing tonight. Enjoy an evening of world music by the band Shoonya, featuring Milind Date on the bansuri, Ashok Kumar on the djembe and darbouka, Sridhar Sagar on the saxophone, Pramod Stephen on the bass, Kiran Shankar on the keyboard and Shrinidhi on the mandolin. Over 100 films will be screened from all over the world, with a special focus on France. The line-up includes Jackie(Lithuania) and Reality Show (India). There will be a Bharatanatyam performance, Matri Shakti, by Jhinook Mukherjee and group, followed by Music Mind, a combination of Rabindra sangeet and piano by singer Prabuddha Raha and pianist Soumitra Sengupta. 6pm. Rabindranath Tagore Centre, Indian Council for Cultural Relations, 9A Ho Chi Minh Sarani (22822895). The evening will feature Graham Kendrick, a world- renowned songwriter, singer and musician, with singers and musicians from Chennai. They will perform Kendrick classics like Shine Jesus Shine, Heaven Is In My Heart and Servant King. The 2014 Olivier Award-winning comedy is scripted by the Goodale Brothers and was originally directed by Sean Foley. Contemporary artist Eleena Banik’s works include oil on canvas and paper, and acrylic on PVC sheet. 11am-7pm. Apparao Galleries—The Leela Palace, MRC Nagar. For details, call 9941012380. Homegrown progressive rock bands Cosish and Rainburn will headline Progworks On Wheels, the country’s first progressive rock festival. This Hindi comedy, written by K.M. Mishra and directed by Jay Jha, revolves around superstitious Jeetlal who buys horseshoe rings, thinking all his desires would be fulfilled. Instead, his life becomes a roller-coaster ride. 1 hour.